Last weekend saw the first ever deep water soloing competition in the USA take place, the"Psicobloc Masters Series." Competitors were allowed to work the route the day before the main event, practicing taking falls of up to 50 feet into the pool below. 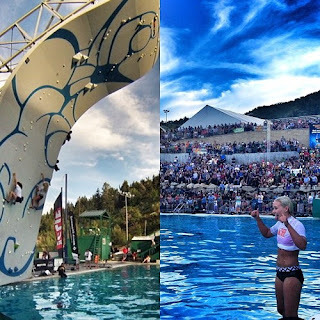 The event was located at the Utah Olympic Park USA, a pool usually used for ski jumpers to practice their soft landings in the water. It had been reported that a couple of the climbers had taken bad falls, with Delaney Miller bruising her chin and Vasya Vorontnikov spraining his ankle! For the original use of the pool, the water is normally ruffled with bubbles to create white water, therefore making softer landings when hitting the water for the ski jumpers. But in the case of the DWS competition, they did not use this well needed facility. Big names like Chris Sharma, Dave Graham, Tommy Caldwell, Sasha DiGiulian, Alex Johnson, Emily Harington also took part and took big falls. The women were up first, with two women climbing simultaneously on the wall at the same time. The climber who won each duel would then advance onto the next round until only two climbers were left for the final. With Sasha and Delaney topping out in the initial rounds, Sasha wisely decided to drop off early to save her strength when her rival fell lower down, this enabled her to save her strength for the rounds ahead. On one round Delaney decided to climb higher rather than jump off as reportedly the bad fall in the practice rounds had seemed to have spooked her, opting to down climb the scaffolding at the back of the wall rather than jumping from the top. The fresher Sasha then climbed to victory. After Dani Andrada reset the route, it was the mens turn. Everyone wanted to see Chris Sharma dyno his way to the top, but he surprisingly fell on a tricky dyno mid height, giving an opportunity for Matty Hong to come 3rd place. In the end it was Jimmy Webb Vs Daniel Woods, with Jimmy taking 1st place and Daniel taking Silver in 2nd place. The competition was organised by Mike Beck and Chris Sharma to coincide with the outdoor retailer trade show, and as expected it was a great success. Lets hope there are many more DWS competitions to come.